Why is this important for the region? The investments in the Mayors’ Council Ten-Year Vision are essential for people in Metro Vancouver, especially as the region is expecting over 1 million more residents in the next 25 years. These projects will create thousands of good, middle class jobs during construction. Once completed, they will meet current and future transportation needs, reduce traffic congestion and air pollution, and create more livable, connected communities. This will help people spend less time stuck in traffic, and more time with their friends and family. It will also benefit the environment as people will have more opportunities to leave their car at home and get to where they need to go quickly and efficiently. Building the Broadway Subway and the Surrey-Newton-Guildford LRT line will deliver cleaner air, faster commutes, and a stronger economy for the entire region. We are also working with the City of Surrey and the City of Vancouver to build affordable homes along these new rapid transit lines, so that local families can reap the full benefits of these investments. Adding rapid transit to the network will help reduce traffic congestion on key corridors, reduce overcrowding on transit in the area, and make the region better for everyone. Demand for transit is only going to grow as we add more than one million people to the region in the next 30 years. In 2017 alone, TransLink saw a 6% increase in transit ridership. Once these projects are completed, what will be the travel benefits? Once opened, regardless of the time of day or traffic conditions, the commute from Commercial Broadway Station to Arbutus Street will take 11 minutes, saving the average commuter almost 30 minutes a day. This is huge compared to taking a bus which, with anticipated congestions due to growth in development, people and jobs by 2045— could take anywhere from 30 to 55 minutes, almost an hour, depending on the time of day. These times are reliant on time of day, congestion, and capacity as people can wait as many as three buses to pass them by before they can get on one. This gives people 30 minutes per day to be with their friends and family, to get some extra sleep, to pursue their own interests. 30 minutes per day, on a five day per week work schedule, gives people back 120 hours each year. And for an average 140,000 passengers per day, that will be a huge improvement on their quality of life. People will be able to travel from Guildford to Newton Station in approximately 27 minutes. Who is funding and delivering both projects? Canada, B.C., TransLink and local municipalities are all funding partners in the Mayors’ Vision. The Province’s contribution of $2.54 billion will add up to 40% of the capital costs of Phase Two of the Mayors’ Council 10-Year Vision for transit in Metro Vancouver. 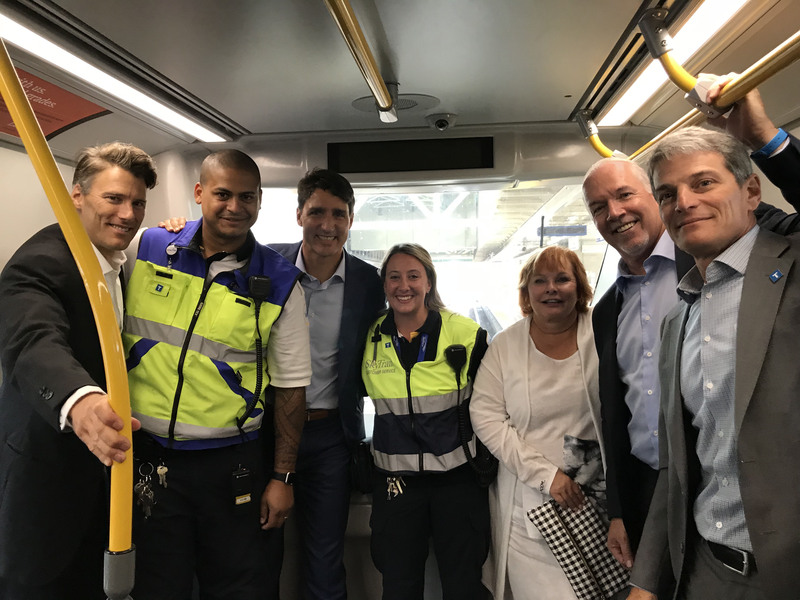 The Broadway Subway, with an estimated budget of $2.83 billion will be funded and delivered by the Government of B.C., with contributions from the Government of Canada and the City of Vancouver. It will be fully integrated into the regional transportation network and operated by TransLink upon completion. The Surrey LRT Project with an estimated budget of $1.65 billion, will be funded and delivered by TransLink, with contributions from the Government of Canada and the City of Surrey. As usual, RIP Surrey. True BRT would do the same as LRT, and would actually be better as they have rubber tires, and can drive onto normal roads in case of detour. Well, we saw how long it took for the fare gates to actually start functioning as intended. disappointed. invest more in the future of surrey! once more and more people come here the LRT wouldn’t be enough. and besides, car crashes could mean the LRT can come to a screeching halt, and causing more issues. i’d rather a less permanent BRT and then a SkyTrain.